Edit: (2016-07-25) Latest patch / mining has fixed the tooltip. Thanks wowhead! Seems like the value of this trinket will shift during combat every few seconds to add a nice reward to your nukes if you have the skill to watch buffs / create weak aura's / set up TellMeWhen. The critical strike formula at level 110 is 350 rating for 1%. On average this will provide ~2.86% critical strike, with the potential high of 3.82%. Where C is the card (assuming Ace is high and 2-7 are low). The internal interval value is currently data-mined at 20 seconds. Since most fights are at least 3 minutes long, given the 20 second shuffle you have a decent chance of hitting everything in the deck on most encounters. Edit: Updated to show fully upgraded (850 item level) stats. In case you play with sound: This trinket makes a sound when the deck is reshuffled. It sounds like picking up and dropping a tome in your inventory. You can not use more than one of these decks at a time despite them not sharing a unique-equipped category. You can certainly equip two at a time, but any time the card shuffle procs it overwrites the existing deck 'draw' buff regardless of which deck it originated from. I'm unsure if this a bug or not. It's a reported issue on the official forums as far back as September 2016, but I'm unable to find a blue post commenting on it. According to Ask Mr. Robot the trinket should have an equal chance for each card to proc, the proc lasts 20 seconds and can happen multiple times in a row. For example: You can get the buff "Seven of Hellfire" two or more times in a row if you are lucky. 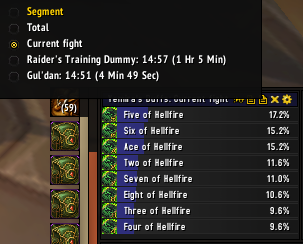 I spent 1 hour 5min auto attacking a training dummy as a Resto Shaman and these are the proc chance results I am getting, which seems just about true to the theory of Ask Mr. Robot if you account for luck and such. This should even out as roughly ~1339 crit, so you could say it is just a glorified statstick with a bit of RNG involved. That said; if you don't mind pocketing out a chunk of gold to get an int/crit trinket it can be a nice alternative to waiting for that sweet iLvl 895 (Mythic) Brinewater Slime in a Bottle which has 1968 Intellect & 1158 Crit compared to Darkmoon Deck: Hellfire's 1634 Intellect & ~1339 Crit. Obliterated into 253 Obliterum Ash. As of 7.2.5, this item appears to have a base item level of 850, not 835. This is with 0/10 obliterum or other item modifiers. I will submit a screenshot for posterity. Equip: Increase Critical Strike by 20-40. The amount of Critical Strike depends on the topmost card in the deck.